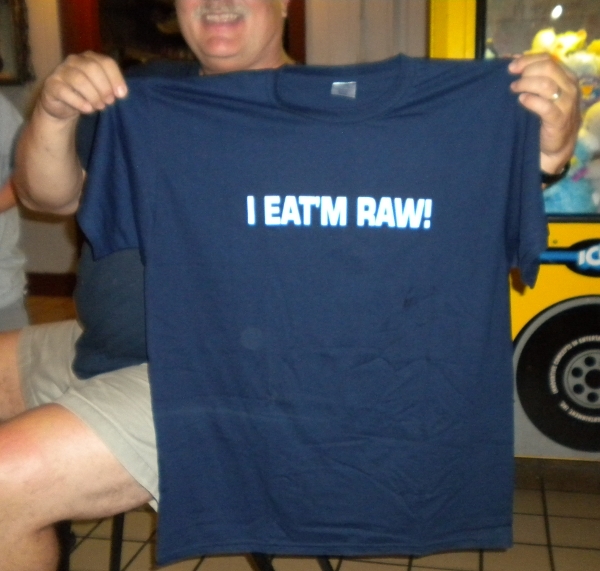 Homeowner Dennis Says, "Eat 'em Raw & Let 'em Slide!" Most people either love them or hate them, but oysters seem to be the craze these days. In every major city you’ll find a fancy “oyster bar” where you’ll spend 10 bucks for a half dozen of these slimy little mollusks. They’re served raw, steamed, deep fried, put in chowder or used in all sorts of recipes. We’ve seen them featured on the food channel in weird eating contests where people will eat hundreds of raw oysters in one sitting. If you are one of those who just loves these little creatures and can’t get enough, or, if you want to see if you have the fortitude to down a few raw oysters right out of the shell, then you’re in luck. 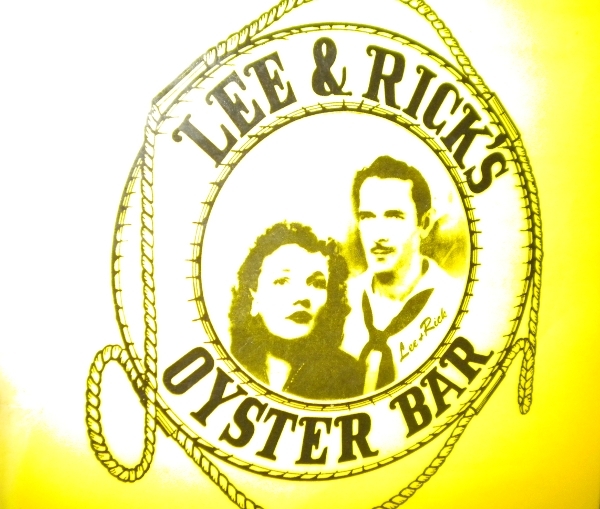 Right here in Orlando is Lee & Rick’s Oyster Bar. The oysters are delivered three times a week from the Apalachicola area in the gulf. Your dining experience begins when you get a table or grab a stool and sit at the cement bar where they spray it down with a garden hose to clean up. 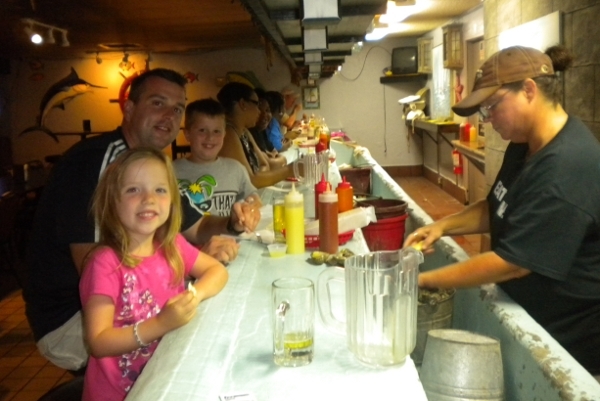 Start by getting a bucket of fresh, raw oysters (2-1/2 to 3 dozen) for 17 bucks and the server (wearing a T-shirt that says, “I eat’m raw!”) cracks them open faster then you can slide ’em down yer gullet. Grab the oyster shell, add a little lemon or hot sauce, put it to your mouth and LET ‘EM SLIDE…get a napkin from the overhead dispenser, chew on a saltine cracker and start over. You’re allowed to pause for a drink of ice cold beer, if necessary. 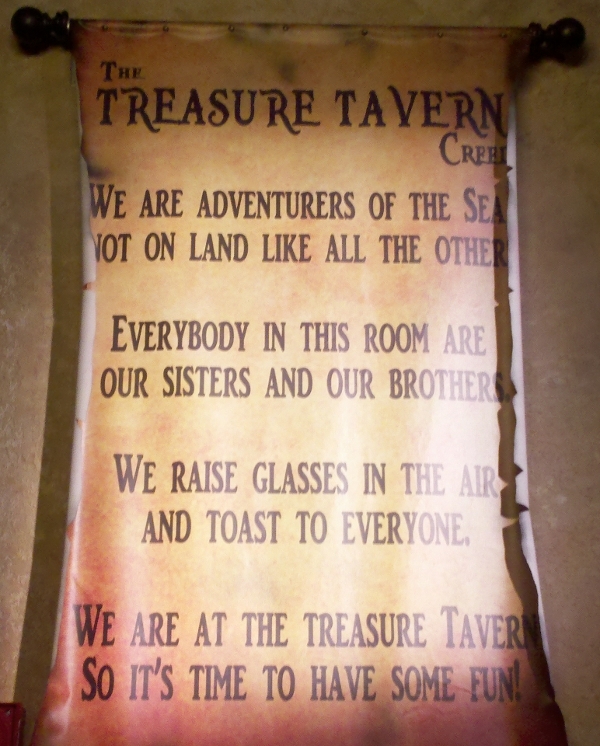 If you want to sit at the bar, get there early! Although Number One Son and Daughter love Iron Chef, I have never watched it. I don’t know who Cat Cora is. 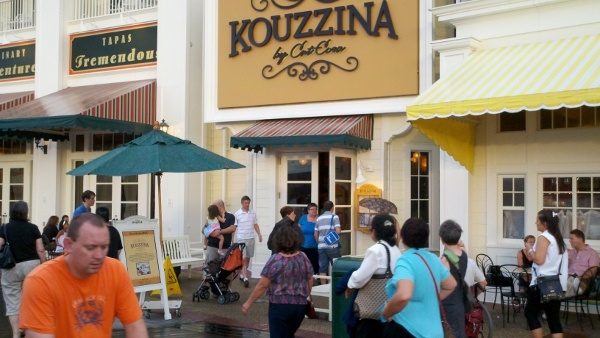 Mrs. LanceAround and I decided to treat Our Friend Karen to Cat Cora’s recently opened Greek/Southern restaurant, Kouzzina, on the Boardwalk in Disney World. According to our menu, Cat Cora was born to a family of Greek restaurateurs in Mississippi. Kouzzina means “kitchen” in Greek. Cora became famous as the first female Iron Chef on the Food Network’s hit show. This is her first signature restaurant. She has blended the Greek food of her ancestors with a Southern twist from her native Mississippi. 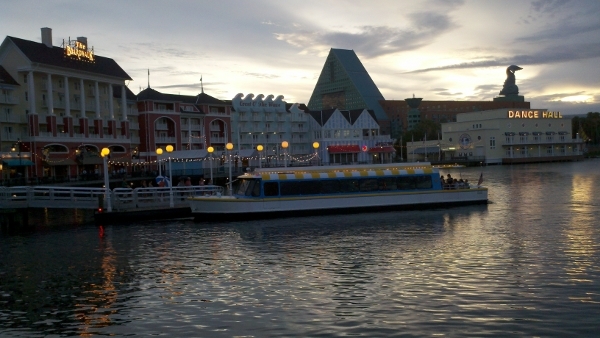 I decided to begin the evening by parking in the Hollywood Studios parking lot and taking a Disney Friendship boat to the Boardwalk. The flaws in my quixotic plan soon became evident as a light rain shower, longer than anticipated walk to the boat and noise of the boat engine drowning any attempt at conversation made me wish I had just parked at the Boardwalk. 1. The restaurant, with its large open kitchen, was just one room jam packed with tables and noise so loud that conversation was impossible. 2. 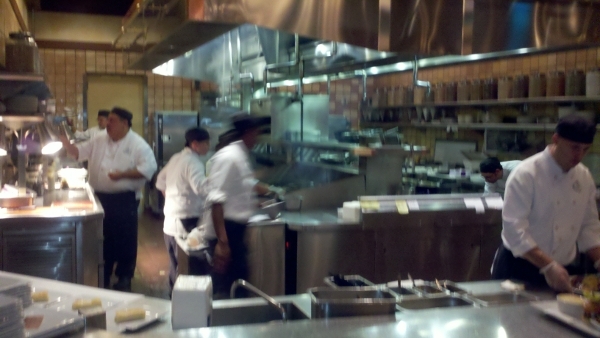 The waitress, while knowledgable and efficient, was robotic and inattentive. 3. 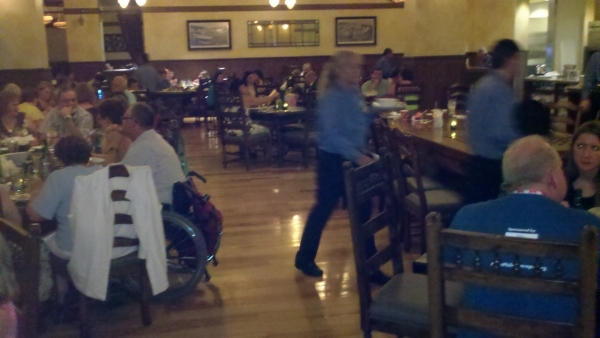 Thinking that the casual atmosphere of the boardwalk and the assembly line atmosphere of the restaurant and wait staff meant this would be a moderately priced affair, we did not expect entrees priced from $20 to $28 and appetizers approaching $10 each. 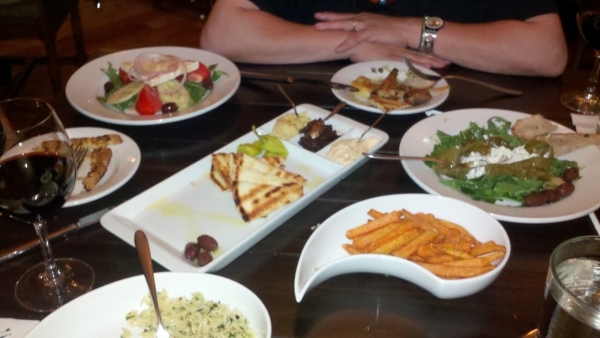 Though the description of the entrees was enticing, we wound up ordering 7 different appetizers and salads. Our fear of an extended wait for food came to a sudden halt when everything was served to us in, literally, two to three minutes. All 7 items arrived before our waitress had time to get Mrs. LanceAround and Our Friend Karen the beverages they had ordered. “So much for ‘freshly prepared’,” I thought as I noticed that the Spanakopita, a complex phyllo pie of spinach, feta, leeks and dill, was at our table faster than it would have taken a team of chefs to put one together! The climax of our misguided adventure came when I tried to cut the Saganki (a seared Greek cheese with lemon and oregano served next to toasted bread) and got a blistery burn on my finger from the cast iron bowl. It was clear that nothing would go right tonight. Then, we took our first bite. Because of my commitment to a new, healthier lifestyle, I was not eating that late at night, so I have to rely on Mrs. LanceAround and Our Friend Karen to report on the experience of actually eating at Kouzzina. Their opinion was quick–Mrs. LanceAround thought the food was fantastic and Our Friend Karen thought it was just OK.
Mrs. LanceAround said the Spanakopita was bursting with flavor, the Saganki was scrumptious, the sweet potato fries were tasty, the greek salad was divine, the goat cheese stuff grape leaf was both unique and delicious, the herbed orzo provided a nice compliment to the harissa yogurt. Kalamata fig and hummus spreads served with grilled pita. If nothing else, it was an unusual and eclectic mix of tastes and textures. Seven appetizers and two glasses of wine came to over $70. Mrs. LanceAround and Our Friend Karen were now content as we rode the boat back to the Hollywood Studios parking lot under a now rainless sky. It was a more relaxing and peaceful end to the evening. I’m reminded of one of my favorite foreign films–Babette’s Feast–which portrays how a community can come together and enjoy each other over a delightful meal. It was interesting to note how our experience at this restaurant so closely paralleled the numerous reviews I found later when researching it on the web. 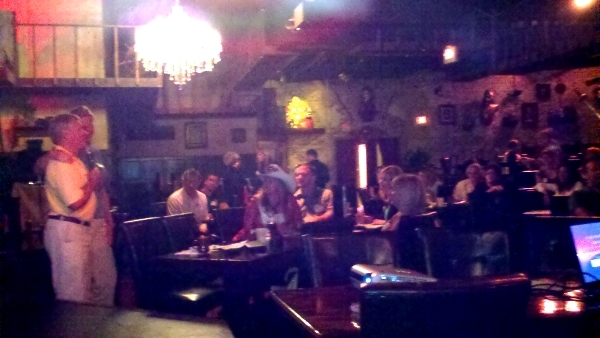 In summary, skip Kouzzina if you want nice atmosphere or great service. Enjoy it if you are looking for a creative, unique combination of Greek and Southern food and have some money to spend. In other words, the food was good enough to recommend trying Kouzzina despite the horrible atmosphere and service–but just barely. 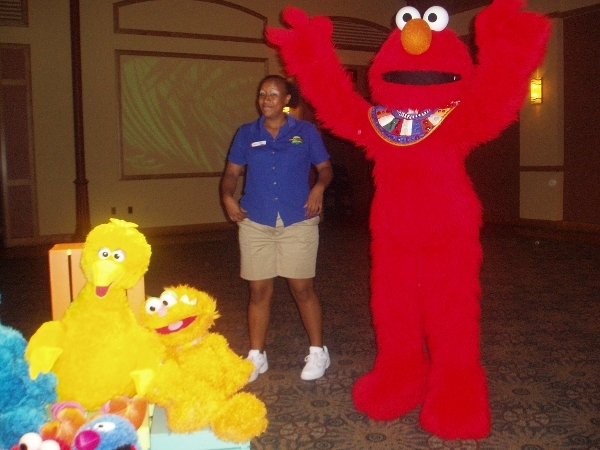 Tickle Me Elmo made an appearance at our vacation rental home managers monthly meeting to promote the new Sesame Street Safari of Fun area in Busch Gardens Tampa theme park. This new area in the Africa section of Busch Gardens features a plethora of rides and attractions designed for the youngsters. 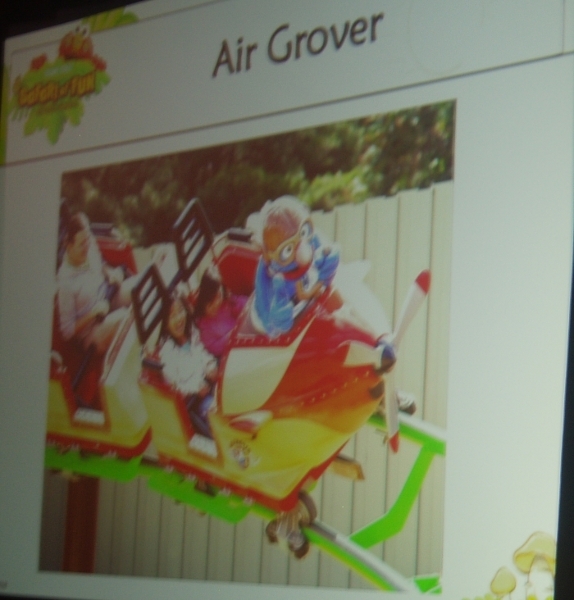 The Air Grover junior roller coaster soars over the Sahara with Grover in the pilot’s chair and parents can ride with children. Encounter The Count in his Zambezi Rally with child sized cars. Zoe-patra & the Hippos of the Nile is a fun flume ride with a riverside glimpse of Africa. Elmo’s Safari Go-Round teams parents and children on a carousel. Rosita’s Djembe Fly-Away is a swing ride above the African canopy. Big Bird’s Whirly Birdie is a child size ferris wheel for children and parents. To cool off from the hot, African frolic, children will love splashing around in Bert & Ernie’s Watering Hole. In addition to all these rides, the safari of fun features a 4-D theatre show, tales of adventures, character encounters, netted play area, a sand filled beachy oasis, a trading post and the opportunity to dine with Elmo and friends! 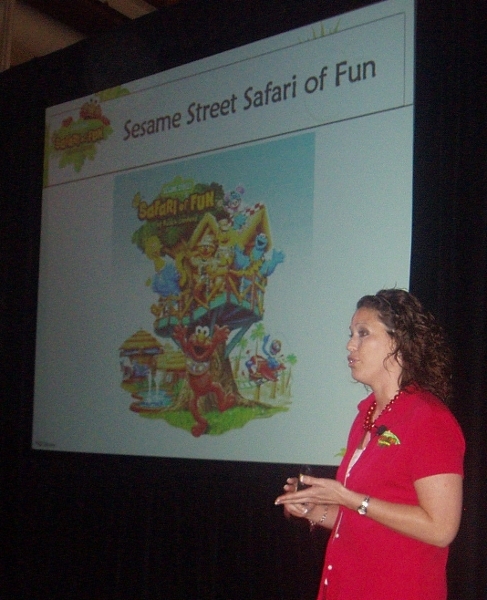 No doubt Busch Gardens has drawn from their years of experience as the creators of the Sesame Place theme park just outside Philadelphia. I have fond memories of Mrs. LanceAround and I taking our children to Sesame Place during our time in Pennsylvania many years ago. There is nothing to compare to the experience of young children enjoying the companionship of the characters of Sesame Street. Adherents of the raw food movement believe that cooking food kills healthy, life-giving enzymes. Often raw fooders are vegan and prefer organic ingredients. Vegan is a strict form of vegetarianism where no animal products are consumed, including dairy, eggs, honey, whey and so forth. Raw food proponents go a step further. They do not heat any food beyond 118°. Hence the name: Cafe 118º. Joseph Diaz is the owner, operator, chef and–as he likes to point out–occasionally the dishwasher at Cafe 118°. 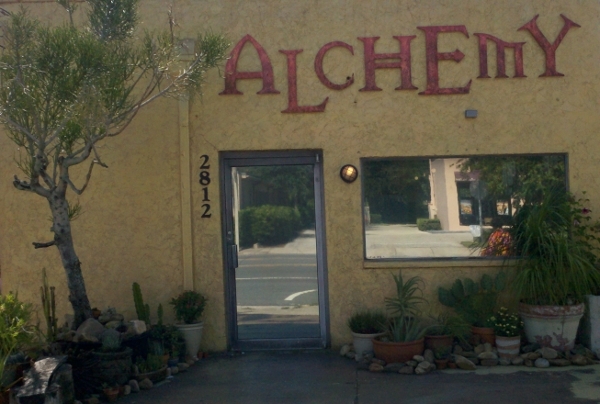 This unique, raw food restaurant in downtown Winter Park, just north of Orlando, has been open for almost two years. Joseph is quick to say, “This is gourmet raw. The flavors are more impactful, palatable, than the traditional raw. It is clear that Joseph is passionate about this concept and his restaurant is a testament to his passion. Mrs. LanceAround and I stopped there for a casual lunch. I ordered the lasagna while she tried the taco salad. The lasagna was a layered combination of raw (obviously), sliced zucchini and other veggies interspersed with a creamed nut, herb, pesto and tomato sauces. The taco salad was fresh organic lettuce with beans, corn and a Mexican spiced sauce drizzled on top served over a bed of raw tortilla chips. Both were unique, gourmet and, surprisingly, quite tasty! We topped off our meal with Coconut Macaroon vegan raw ice cream. The primary ingredient was some kind of young, tender Thai coconut. It was scrumptious! We asked our server where they get all their organic ingredients. 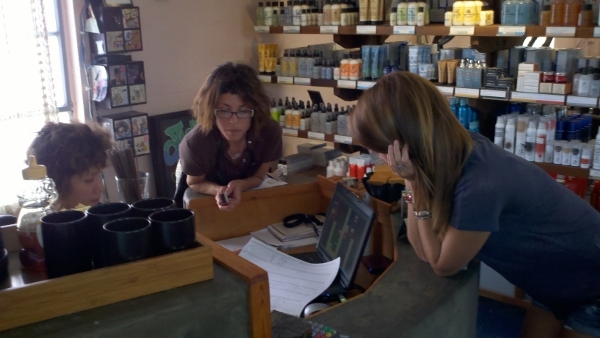 She told us that what they don’t get from local vendors is deliverd by Global Organic out of Sarasota. As we were driving down interstate 4 on our way home from the restaurant, we had a serendipitous experience. 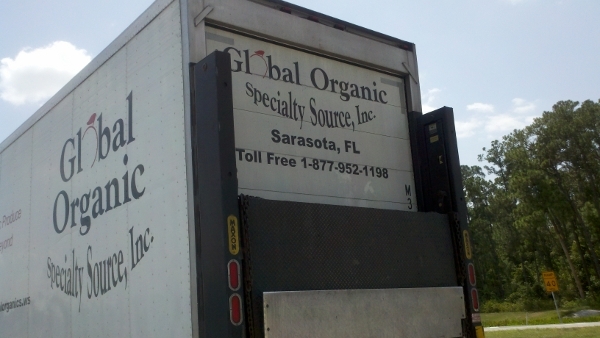 We noticed we were passing the Global Organic Delivery truck. Did our meal just come from inside that vehicle? 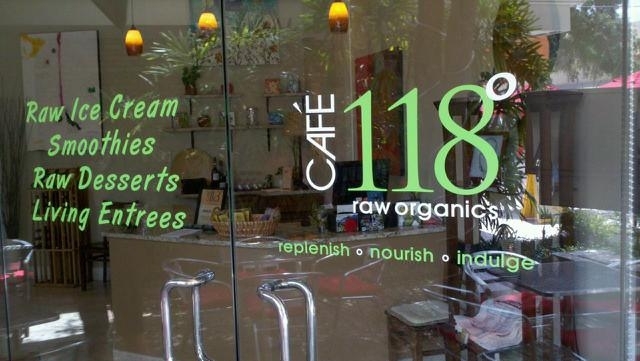 If you are looking for something adventurous and new, we highly recommend trying the raw food at Cafe 118º. Expensive organic ingredients and extensive prep time that includes a lot of dehydration makes for a higher priced meal with smaller portion sizes. But this is one restaurant that will always place a value on quality over quantity. Plus the great food and unique experience makes it worth the trip! When you go, let us know if you like it. For the lucky readers of my blog who are seeking a truly natural Florida beach experience, you will be pleased to discover Sebastian Inlet state park . This is a great alternative to the more commercialized beaches, such as Cocoa or Daytona. Here, the crowds are sparse, the beaches serene and the wildlife abundant. Of course, there’s no stores, no pizza parlours and no ice cream shops. Instead, the Sebastian Inlet provides one of the best opportunities for surfers. According to surfguru.com: “Sebastian Inlet is a very consistent surf break! Sand bottom with refraction off the jetty bends the wave to form a powerful wedge effect! Big lippers and air launches! Along with right and left tubing waves! Not a place for beginners! Heavy locals, Big talent, and most of the pro surfers congregate at the 1st peak to show off their talent on a good day.” LanceAround does not understand a word of that report, but it sure sounds like a lot of fun. On Sunday, Number One Son, Number One Daughter and Mrs. LanceAround took a well deserved break and drove to Sebastian Inlet. We parked our car right beside the bathroom facilities. Outside, there was also a convenient shower useful for washing off the sand on your way out! 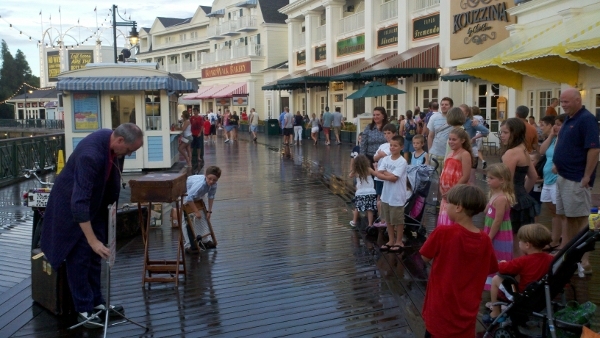 A short boardwalk takes you from the bathrooms to the beach. 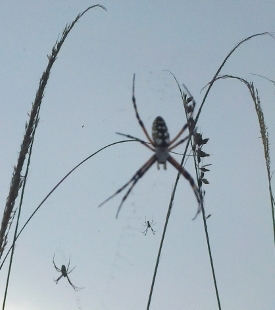 Along the way, the tall grasses were teeming with large, Golden Silk Orb-Weaver Spiders. They created a magnificent array of beautiful webs. Number One Son and I enjoyed an hour long swim while Number One Daughter joined Mrs. LanceAround in a relaxing nap on the beach blanket. 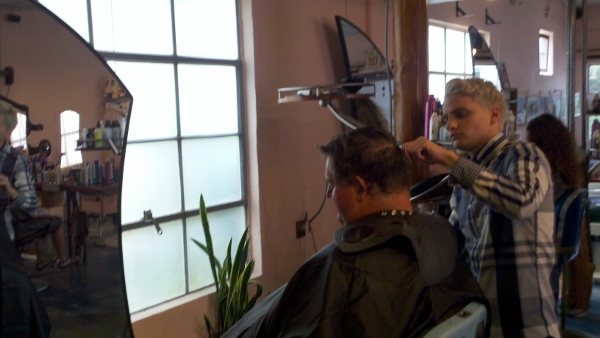 We then used the showers to remove all the gritty sand and drove to Vero Beach to enjoy an Indian meal before heading home for the evening. Located between Melbourne and Vero Beach, Sebastian Inlet State Park is only a 90 minute drive from downtown Kissimmee. In addition to pristine beaches, it features the premier saltwater fishing spot on Florida’s east coast. There’s surfing, the McLarty Treasure Museum, the Sebastian Fishing Museum, scuba diving, snorkeling, canoeing, kayaking and nature trails. Full facility campsites and a boat ramp are also available.